Our Service Dog Harnesses are specifically designed for dogs who perform a special service for their owners. 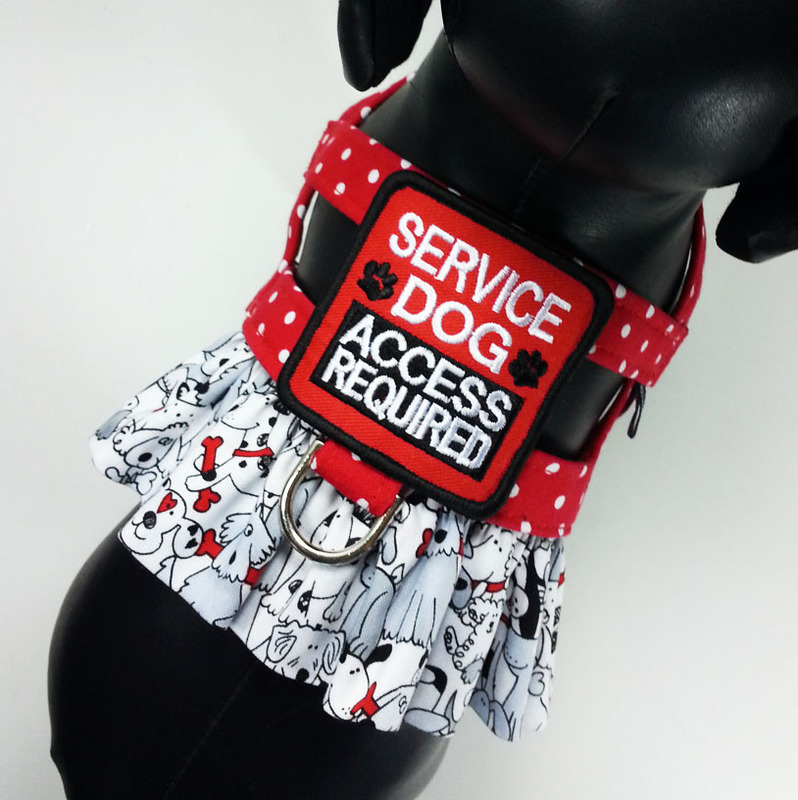 With our Service Dog Harness, your service pet can be fashionable while also alerting people that your dog has a responsibility that requires his or her full-time focus. To order, choose one of the basic designs you see below. On the detail page, you will select your preferred patch. As always, we cheerfully exchange your new harness with a different size if the one you ordered doesn't fit. 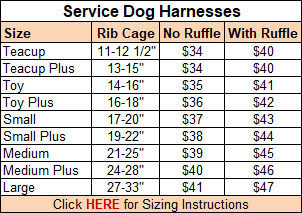 But for best service, please visit our Harness Sizing page for instructions on determining the correct size. Our small dog harnesses are ideal for walking your dog. They adjust to fit, go on and off easily, and are safe and secure for your pet. They are machine washable (line dry recommended) and hand crafted in the USA using quality materials reflecting the latest fashion trends. In addition to our harnesses, we make matching Dog Hats, Collars, Leashes, Lightweight Leads, Bandanas and Dooty-Duffels (for discreet pickups). Service Dogs are trained to perform specific tasks to help an individual with a disability. An example of a service dog is a dog who guides an owner who is blind, or a dog who assists someone who has a physical disability. Service dogs stay with their person and have special access privileges in public places such as on planes, restaurants, etc. Therapy Dogs and Emotional Support Dogs do not have the same special access privileges as Service Dogs. Learn about the differences here.